Background: To prevent infectious complications from transient bacteremia in patients with specific medical conditions, antibiotic prophylaxis is considered. Although many guidelines for antibiotic prophylaxis have been published; recommendations are often unclear. This study was conducted to assess the confidence of the dental students in administering antibiotics for the patients with systemic diseases. Materials and Methods: A cross-sectional, descriptive questionnaire survey employing cluster random sampling was conducted among dental colleges in Chennai. 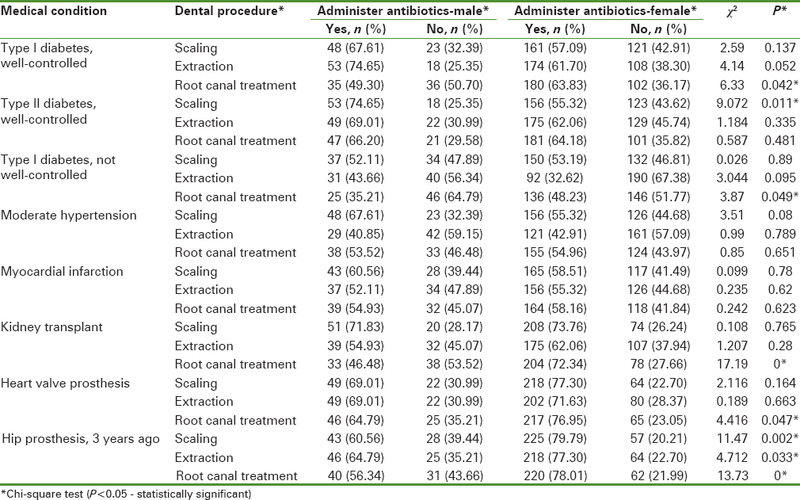 The questionnaire comprised eight simulated cases of patients with different medical conditions, the following dental procedures such as scaling, simple extraction, and root canal treatment, and visual analog scale (VAS) were used to assess how confident are the interns in their decision to administer antibiotics. Chi-square test was used difference in decision across gender, and independent samples t-test was used to test the overall confidence in decision in the administration of antibiotics. P < 0.05 is considered statistically significant. Results: Response rate in the present study was 76.6%, n = 353 study participants participated in the present study. The overall mean in confidence assessments for the study participants was 75.6 mm on the VAS and the range was 64–86 mm. Study participants differ in their opinion in the administration of antibiotic prophylaxis for dental treatment in the management of patients with systemic diseases (P< 0.05). Conclusion: Although the study participants are generally aware of antibiotic prophylaxis, they were not clear in their decision in administration of antibiotics and their level of confidence is also low. Dentists prescribe medications for the management of a number of oral conditions, mainly orofacial infections. Since most human orofacial infections originate from odontogenic infections, the prescribing of antibiotics by dental practitioners has become an important aspect of dental practice. For this reason, antibiotics account for the vast majority of medicines prescribed by dentists. Antibiotics prescribing may be associated with unfavorable side effects ranging from the gastrointestinal disturbances to fatal anaphylactic shock and development of resistance. The increasing resistance problems of recent years are probably related to over- or misuse of broad-spectrum agents such as cephalosporins and fluoroquinolones. Even though many guidelines for the rational use of antibiotic prophylaxis have been published, recommendations are often unclear and ambiguous. This uncertainty could be divided into three different types. The first results from clinicians having incomplete knowledge of the situation. The second is due to the limitations of the present medical knowledge. The third is a combination of the first two, where there is difficulty distinguishing between personal lack of knowledge and limitations in current knowledge. Common dental procedures induce transient bacteremia. To prevent infectious complications from transient bacteremia in patients with specific medical conditions, antibiotic prophylaxis is considered. Dental students were exposed to patients with medical conditions during their training, their overall competency in prescribing drugs was 65% and 63% in the previous studies;, however, the previous studies do not assess their confidence in treating patients with systemic diseases,; hence, the present study was conducted with the aim to assess the confidence of the dental students in administering antibiotics for the patients with systemic diseases for common dental procedures. To assess how confident are the dental students in their decision to administer/or not to administer antibiotics for the patients with systemic illnesses. A cross-sectional descriptive study employing cluster random sampling was conducted among the dental colleges in Chennai. Dental students in their final year and internship among the 12 dental colleges in Chennai  constituted the study population. Final year dental students and interns of various dental colleges in Chennai in the year 2014–2015 who are willing to take part in this study were included, and the final year dental students and interns who had already participated in any previous studies of such kind and who have not given consent to participate in the study were excluded from this study. Before the start of the study, ethical approval was obtained from the Institutional Ethics Committee, Chettinad University. An approval from the concerned dental college authorities and written informed consent from the participants were obtained before the start of the study. The interns knowledge in administering drugs was estimated to be 63% among interns of various dental colleges in Chennai, and the sample size was 317 dental students and interns. A pretested survey pro forma used in the previous study conducted by Ellervall et al. was used. The questionnaire comprised eight simulated cases of patients with different medical conditions. The pro forma consisted of information on demographic data, followed by assessment of knowledge of the interns in administering antibiotic prophylaxis to the patients with the following medical conditions: (1) Type I diabetes mellitus, insulin-dependent, well controlled, (2) Type II diabetes mellitus, well controlled, (3) Type I diabetes mellitus, insulin-dependent, not well controlled, (4) moderate hypertension, (5) myocardial Infarction 3 months ago, under medication, (6) kidney transplant 3 years ago, (7) heart valve prosthesis, and (8) hip prosthesis, replacement performed before 3 years for the following dental procedures such as scaling, simple extraction, and root canal treatment (placement of rubber dam may cause gingival bleeding), and visual analog scale (VAS) was used to assess how confident are the interns in their decision to administer antibiotics. After a brief introduction on the purpose and intent of the study with the help of participants information sheet, informed consent was obtained and questionnaire was distributed through the interviewer with the help of department of public health dentistry in each of the selected colleges, and the filled questionnaires were collected using a drop box placed at a common place (Library). Only completely filled forms were considered for the analysis. The data collected was analysed and tested for significance using IBM SPSS software version 16.0. Frequency tables were computed. Chi – Square test was used to find the difference in decision in administering antibiotics across gender and Independent samples t- test was used to test the overall confidence in decision in administration of antibiotics. For all the tests, (P< 0.05) is considered statistically significant. This study was conducted to assess the knowledge and confidence among the dental students and interns in the administration of antibiotic prophylaxis for the management of patients with systemic diseases. The response rate in the present study was 76.58% (353/461). 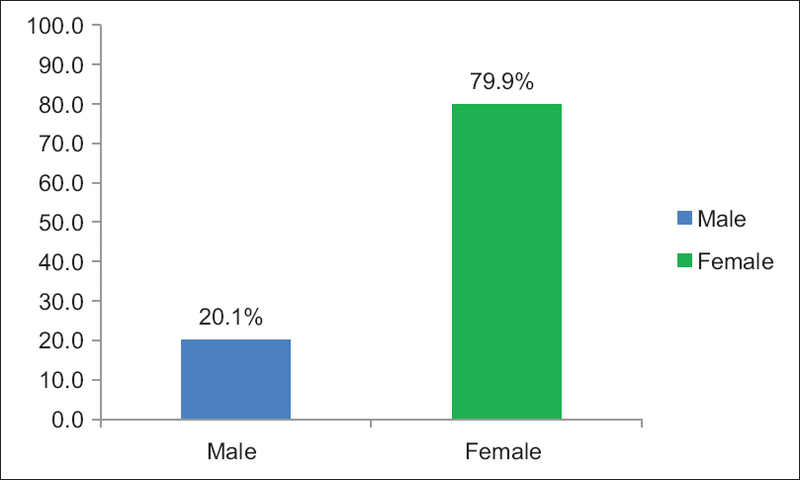 [Figure 1] depicts the distribution of study participants according to gender, among the 353 study participants, 71 (20.1%) were male and 282 (79.9%) were female. The overall mean in confidence assessments for the study participants was 75.6 mm on the VAS and the range was 64–86 mm. [Table 1] depicts the strategies in the administration of antibiotic prophylaxis and level of confidence in administration of antibiotics among dental students. Study participants differ in their opinion in administration of antibiotic prophylaxis for dental treatment in the management of patients with systemic diseases. There is a significant difference among the study participants in their decision on administration of antibiotic prophylaxis for the following medical conditions, Type I Diabetes (Well – Controlled) to undergo Scaling, Type II Diabetes (Well Controlled) to undergo extraction of teeth, Type I Diabetes (Not Well Controlled) for scaling and Moderate Hypertension patients for the following procedures like scaling and extraction and Myocardial Infarction for the following procedures such as scaling and extraction. In all the above mentioned medical conditions, the participants who would not administer antibiotic prophylaxis were more confident in their decision than those who would administer antibiotics for the dental procedures such as scaling, extraction, and root canal treatment (P< 0.05). In the following medical conditions kidney transplant for the following procedures like extraction and root canal treatment, heart valve prosthesis for scaling, extraction, and root canal treatment and for hip prosthesis, before 3 years for extraction, the study participants who would administer antibiotic prophylaxis were more confident in their decision than those who would not administer antibiotic prophylaxis for dental procedures (P< 0.05). [Table 2] depicts the gender differences in administration of antibiotic prophylaxis for dental procedures in patients with medical disorders. Significant difference in their decision toward administration of antibiotic prophylaxis was found in the following medical conditions such as Type I diabetes, well controlled for root canal treatment, Type II diabetes, well controlled for scaling, Type I diabetes, not well controlled for root canal treatment, kidney transplant for root canal treatment, heart valve prosthesis for root canal treatment, hip prosthesis for the following dental procedures scaling, extraction, and root canal treatment. Prophylactic antibiotics, taken before a number of dental procedures, have been advocated to reduce the likelihood of postoperative local complications, such as infection, dry socket, or serious systemic complications like infective endocarditis. 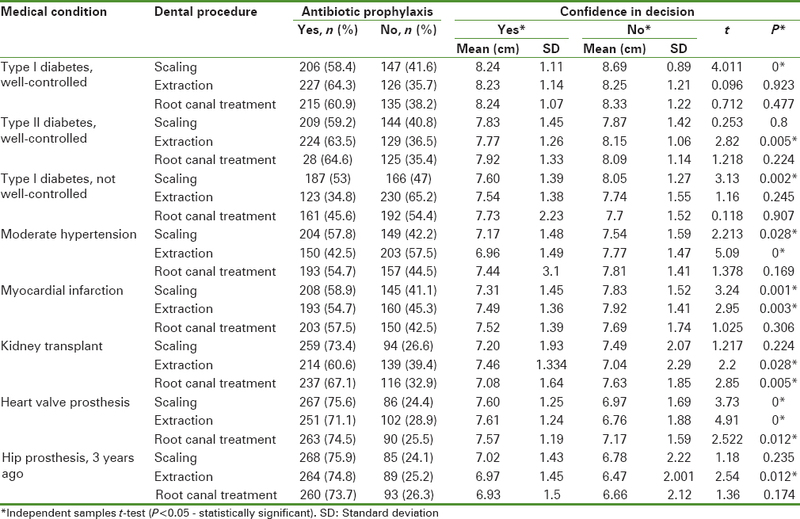 The overall level of confidence among interns toward and or not administration of antibiotic prophylaxis was found to be 75 mm, lesser than that of the general dental practitioners 79 mm in the study conducted by Eva Ellervall et al. in Sweden. Type I diabetes mellitus is considered a risk factor with regard to suffering from infection. For this reason, when invasive dental procedures are performed, the antibiotic prophylaxis is recommended. In the present study, approximately 40% of the study participants reported not to provide antibiotic prophylaxis for patients with Type I diabetes mellitus, the results are in contrast to the recommendations. The following systemic disease conditions like Type II diabetes do not require any antibiotic prophylaxis for invasive dental procedures; however, these systemic diseases have to be kept under control for prevention of spread of infection during dental procedures, In the present study, 63% of the study participants recommended antibiotic prophylaxis in extraction of teeth for patients with Type II diabetes this was in contrast to the recommendations report. Forty-two percent study participants recommended antibiotic prophylaxis in the extraction of teeth for patients with hypertension and 54% of study participants recommended antibiotic prophylaxis in the extraction of teeth for patients with a history of myocardial infarction, the guidelines do not exist for recommending antibiotic prophylaxis for the management of patients with hypertension and myocardial infarction. However, anxiety reduction to relieve stress and appropriate hemostasis is generally recommended for patients with hypertension in dental setting involving invasive dental procedures as uncontrolled hypertension may trigger cardiovascular diseases. Antibiotic prophylaxis is generally recommended for patients with heart valve prosthesis as they were considered to be at risk of developing infective endocarditis. In the present study, 45% of the study participants do not recommend antibiotic prophylaxis for patients with heart valve prosthesis; this was in contrast to the guidelines. The results are in contrast to the study conducted by Palmer et al. where 90% of general dental practitioners would use the current recommended regimen for antibiotic prophylaxis for patients at risk of infective endocarditis. Antibiotic prophylaxis, apart from reducing bacteremia, prevents the bacterial adherence to the endocardium, which could be the ultimate prophylactic effectiveness mechanism. Renal transplantation has been one of the medical miracles of the 20th century and has improved the quality of life of thousands of patients who suffered from a chronic end-stage kidney disease throughout the world. About 67% of the study participants in the present study recommended antibiotic prophylaxis for the dental treatment in patients who had undergone kidney transplant, throughout the international bibliography, there are no clear guidelines as to if and when prophylactic antibiotic therapy should be given to transplant patients who are about to undergo dental procedures, to prevent transient bacteremia, the decision to administer antibiotics before any dental procedure, as well as the selection of antibiotics, should always be made in consultation with the patient's doctor, most of the doctors recommend the AHA's standard regimen to prevent endocarditis as a suggested prophylactic therapy. It is likely that bacteremia associated with acute infection in the oral cavity and other sites can and do causes implant infection, patients with joint replacements who are having invasive procedures or who have other infections are at increased risk of hematogenous seeding of their prosthesis. Given the potential adverse outcomes and cost of treating an infected joint replacement, the AAOS recommends that clinicians consider antibiotic prophylaxis for all total joint replacement patients before any invasive procedure (scaling, extraction, and root canal treatment) which causes bacteremia. The recommendations are in contrast to the results of the present study where only 75% of the study participants recommended antibiotic prophylaxis for the patients with a hip prosthesis and 25% of the study participants do not recommend antibiotic prophylaxis for dental procedures for the patients with hip prosthesis. The limitations of the present study are that there was only limited information regarding the medical condition is provided and the participants have to imagine the general physical health status of the patient in mind before answering the questionnaire. The results of the present study showed that the knowledge of the dental students in the management of patients with systemic diseases is limited and are not much confident in their decision in providing antibiotic prophylaxis for patients with systemic diseases similar to the study conducted by Lauber et al. where the general dental practitioners are not always aware of current clinical guidelines, and dentists and physicians exhibit different patterns regarding antibiotic prescribing. Recommendations on antibiotic prophylaxis have to be emphasized in the curriculum so that the management of medically compromised patients will be greatly improved. Study participants are generally aware of antibiotic prophylaxis however they were not clear in their decision in administration of antibiotics and their level of confidence is also low. This study was financially supported by ICMR, STS. Dar-Odeh N, Ryalat S, Shayyab M, Abu-Hammad O. Analysis of clinical records of dental patients attending Jordan University Hospital: Documentation of drug prescriptions and local anesthetic injections. Ther Clin Risk Manag 2008;4:1111-7. Laskin DM, Laskin JL. Odontogenic infections of the head and neck. In: Laskin DM, editor. Oral and Maxillofacial Surgery. Vol. 2. St Louis: C.V. Mosby Co.; 1989. p. 219-52. Lewis MA. Why we must reduce dental prescription of antibiotics: European Union Antibiotic Awareness Day. Br Dent J 2008;205:537-8. Wise R, Hart T, Cars O, Streulens M, Helmuth R, Huovinen P, et al. Antimicrobial resistance. Is a major threat to public health. BMJ 1998;317:609-10. Jaunay T, Sambrook P, Goss A. Antibiotic prescribing practices by South Australian general dental practitioners. Aust Dent J 2000;45:179-86. Katz J. Why doctors don't disclose uncertainty. In Professional judgement. A reader in clinical decision making Edited by: Dowie J, Elstein A. Cambridge University Press:Cambridge, United Kingdom. 1988: 544-65. Ellervall E, Brehmer B, Knutsson K. How confident are general dental practitioners in their decision to administer antibiotic prophylaxis? A questionnaire study. BMC Med Inform Decis Mak 2008;8:57. McGrath C, Esmonde F. Cobert do dental graduates of the University of Hong Kong (1997-2001) perceive themselves prepared for dental practice? Hong Kong Dent J 2005;2:84-91. Prabhu S, John J, Saravanan S. Perceived competency towards dental practice among interns of various dental colleges in India. J Educ Ethics Dent 2012;2:33-9. Dental Colleges in Tamil Nadu. Available from: http://www.dciindia.org/search.aspx. [Last accessed on 2014 Jan 05]. Dar-Odeh NS, Abu-Hammad OA, Al-Omiri MK, Khraisat AS, Shehabi AA. Antibiotic prescribing practices by dentists: A review. Ther Clin Risk Manag 2010;6:301-6. Gutiérrez JL, Bagán JV, Bascones A, Llamas R, Llena J, Morales A, et al. Consensus document on the use of antibiotic prophylaxis in dental surgery and procedures. Med Oral Patol Oral Cir Bucal 2006;11:E188-205. Silvia Marti Alamo, Yolanda Jimenez Soriano and M Gracia Sarrion Perez. Dental considerations for the patient with Diabetes. J Clin Exp Dent 011; 3(1):e25-30. Popescu SM, Scrieciu M, Mercut V, Tuculina M, Dascalu I. Hypertensive patients and their management in dentistry. ISRN Hypertens 2013; Article ID 410740: 8. [doi.org/10.5402/2013/410740]. Allen U. Infective endocarditis: Updated guidelines. Can J Infect Dis Med Microbiol 2010;21:74-7. Palmer NA, Pealing R, Ireland RS, Martin MV. A study of prophylactic antibiotic prescribing in National Health Service general dental practice in England. Br Dent J 2000;189:43-6. Steering Committee of the Istanbul Summit. Organ trafficking and transplant tourism and commercialism: The declaration of Istanbul. Lancet 2008;372:5-6. Georgakopoulou EA, Achtari MD, Afentoulide N. Dental management of patients before and after renal transplantation. Balt Dent Maxillofac J 2011;13:107-12. Ching DW, Gould IM, Rennie JA, Gibson PH. Prevention of late haematogenous infection in major prosthetic joints. J Antimicrob Chemother 1989;23:676-80. Antibiotic Prophylaxis for a patient with the history of total joint replacement. Steven F. Defroda, Eliza Lamin, Joseph A. Gil, Kunal Sindhu BS and Scott Rittermann. Journal of the American Board of Family Medicine 2016; 29: 500-7.